Yes I know, everyone is on a diet right now. Oh wait, I mean "lifestyle change." Taking a break from rich desserts, cookie jars, and cheese-filled appetizers. Well, I'm not going to lie, we kind of are too, and I actually made this way back at Thanksgiving, I just haven't had a chance to share it with you yet. But despite that, I'm still going to tell you to find an occasion to make this cheesecake. A birthday, an anniversary, a special dinner for Valentine's Day, Saturday... you know, whatever works in your life. I'm not the biggest cheesecake lover, but this one is good. Rich and creamy and topped with a delicious caramel sauce and candied pecans... it doesn't get much better. And go ahead, use the 1/3 less fat cream cheese if you want, I used it for two of the four packages and it turned out perfectly. The best part for those of you Type A dessert makers, the caramel sauce will hide any cracks that you might have. I got lucky with this one though and it came out perfectly without a crack. Spray a 10-inch springform pan with baking spray and place on a double layer of aluminum foil big enough to fold up around the pan. Wrap the overhanging foil around the sides of the pan to seal it. In a food processor, combine the graham crackers and sugar for the crust. Pulse 5-6 times until fine and crumbled. Add melted butter and pulse 2-3 more times until the mix begins to hold together slightly. Pour mix into prepared pan and press into the bottom in an even layer. Refrigerate for 30 minutes. Preheat oven to 325 degrees. Heat a few cups of water in a tea kettle or microwave in a large measuring cup. In a large bowl, beat cream cheese and sugar for 3-5 minutes on medium speed until smooth. Beat in flour and then eggs, one at a time, mixing on low speed just until combined. Add sour cream, milk, and vanilla and mix to combine. Pour mixture into crust. Place the springform pan inside another larger pan (like an 11"x13" baking pan or a 12" cake pan) and pour the hot water around the outside of the springform pan to a depth of approximately 1" to form a water bath. Bake for about 75 minutes, until the center appears dull. The cake should still jiggle slightly in the center. Remove springform pan from the water bath and transfer to a wire rack. After about 10 minutes, run a knife around the edge of the pan to loosen and continue to cool about 1 hour. Transfer to the refrigerator and chill at least 4 hours or overnight. For the topping, stir together sugar and water in a heavy saucepan over medium heat. Stir constantly with a wooden spoon until the sugar is melted. Cook approximately 15 minutes more without stirring until golden brown. Reduce heat to low and gradually add the heavy cream. Cook and stir until the sugar is completely melted and smooth. Using a candy thermometer, increase heat to medium and cook, stirring constantly until the temperature reaches 225 degrees. Remove from the heat and add butter and vanilla. Cool to room temperature. Pour evenly over the cheesecake. In a small skillet, toast pecan halves over medium heat for a few minutes just until fragrant. 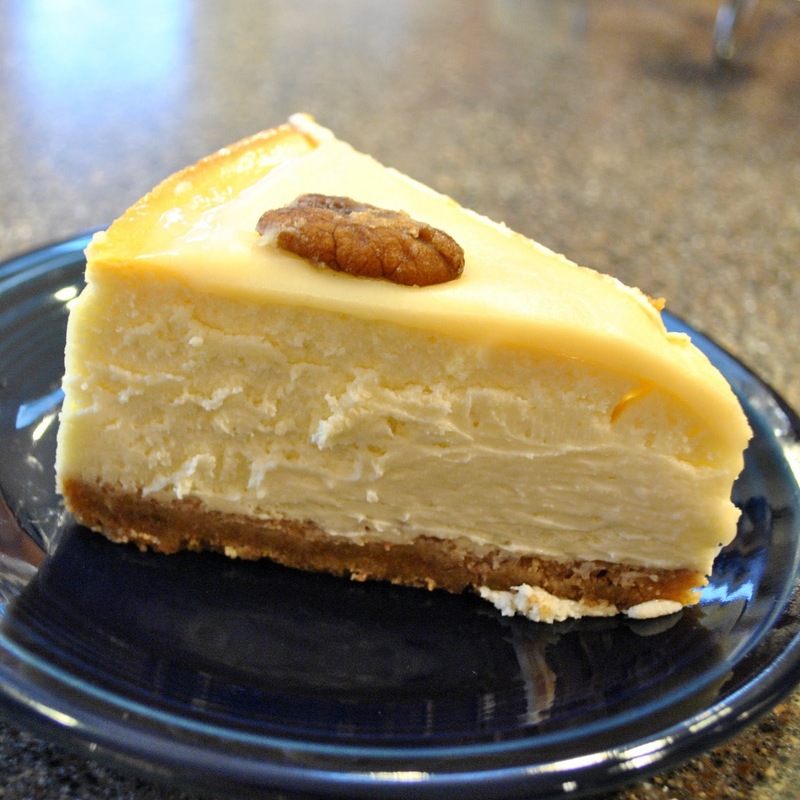 Press one pecan into each slice of the cheesecake or garnish as desired. that looks like perfection on a plate. Thanks very much Mary and welcome! Glad you like the recipes and hope to hear from you again. well that just looks awesome. This looks delicious. I would like to make this recipe on coming weekend at my home. If you're in the mood for an ice cream cake, but don't want to spend a lot of prep time in the kitchen, this recipe really takes the cake! You can substitute sherbet or sorbet for the ice cream for an nice variation.